On this free Montmartre walking tour, you will run into all the romance that Paris stands for. You will explore Paris’ most bohemian, artistic district. You will discover the picturesque streets that inspired Renoir, Picasso, and Edith Piaf. You will photograph some of the best vistas of Paris. And in the end, you will feel very Parisian. The itinerary covers Moulin Rouge to Sacre Coeur cathedral. We make our way up through secluded gardens and back alleyways. We explore the eccentric lifestyles of current and former Montmartre residents. We discover why local residents are so proud of their peculiar vineyard. We run into countless photo opps. And we enjoy the romance of Montmartre. We end at Sacre Coeur, with the best views of Paris lying at our feet. So we can see more, we do not spend time going inside each building. Our Montmartre Tour starts on time every day at 11 am & 2.30 pm everyday rain or shine and last a relaxed 90 minutes. Extra 5 pm tour from March 1 – Nov. 3. The tour runs every day, closed on Dec. 24 & 25 only. 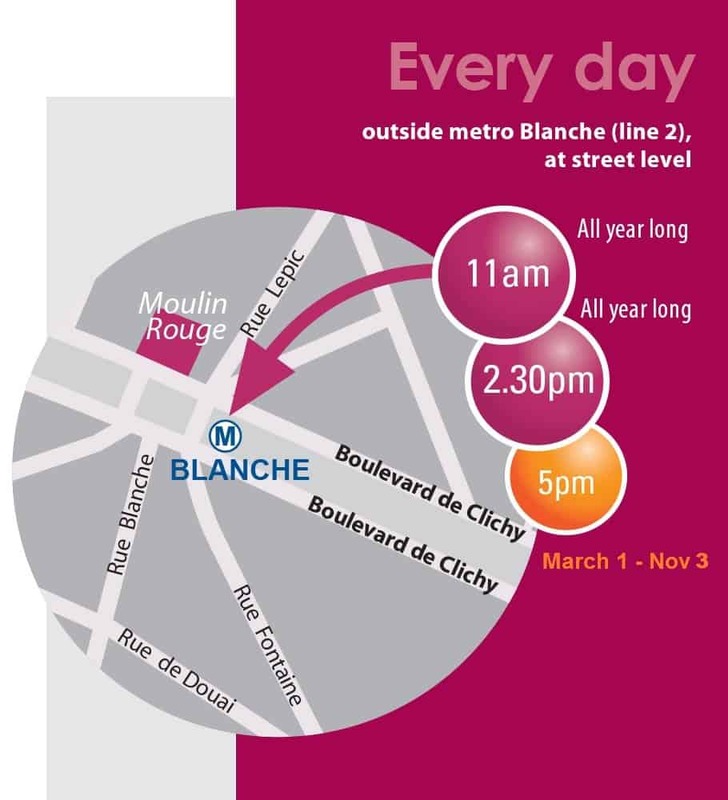 We start outside metro station “Blanche”, at street level. This tour ends near Sacre coeur, 5 minutes away from Anvers metro station. Groups of 8 and more please book. We advise large groups to book a private tour. In the interest of all guests, we reserve the right to accommodate or to turn down large groups. To discover the secret side of Montmartre, the side that has inspired artists over and over again. To keep away from the crowds in this tourist-packed area, and to find hidden gems. To go beyond the obvious photo spots, and catch the heart & soul of the area. 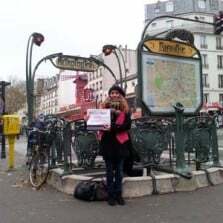 This is a free walking tour of Montmartre, in which you pay the guide what you want at the end of your tour. Advanced reservation is not required. Walks-ins are always welcome. Be at the Montmartre tour meeting point 5 minutes early. If you wish to book in advance, use the “Book Now” button on the right side of this page. Groups of friends, families, and school groups often reserve a private guide for this tour. A private tour costs €125 to €240, depending on group size and tour duration. Wheelchairs not advised on this tour, because of long climbs. 11am & 2.30pm every day rain or shine. Extra 5pm tour from March 1.